Abbotsford, BC – Dr. Garry Fehr has been named Director of the Agriculture Centre of Excellence (ACE) at the University of the Fraser Valley. Fehr is a faculty member of the Geography and the Environment department and will work with internal and external advisory committees while reporting to Dr. Adrienne Chan, Associate Vice President of Research, Engagement, and Graduate Studies. This is a three-year appointment in a newly established role. UFV has been providing agricultural education programs for more than 40 years in the disciplines of horticulture, livestock, and integrated pest management. The Agriculture Centre of Excellence has an expanded mandate of promoting and championing agricultural innovation in the areas of education, career development, research, and technology. The ACE will be a hub for agriculture in British Columbia by bringing together and sharing expertise from the university, the agricultural industry, and industry stakeholders. This multi-disciplinary approach will encourage participation in research and program development from a number of disciplines and academic departments, including agriculture, biology, business, trades, geography, health, and social sciences. There are five broad areas of focus for the Agriculture Centre of Excellence: agribusiness and technology; food ingredients and value-added foods; sustainable production practices; skilled labour development and industry change; and rural entrepreneurship and agritourism. The centre will also work with the UFV Continuing Education department to facilitate the development of programming. Agriculture and the Environment has been identified as an area for program growth in the UFV Strategic Enrolment Management plan. Fehr is looking forward to his new role and the opportunity for outreach it will provide. Fehr came to his academic career as a mature student, after having worked for 19 years in the construction and primary resources services sector throughout British Columbia. During this time, he also provided leadership for several humanitarian aid projects in Latin America and India. He completed his Bachelor of Arts in Geography at Thompson Rivers University in 2003 and his PhD at the University of Guelph in 2008. He joined the Geography and the Environment department at UFV in 2007. The provincial government provided funding to help complete new Agriculture education facilities at the UFV Chilliwack campus at the Canada Education Park in 2013. At that time, it directed UFV to create an Agriculture Centre of Excellence. The new greenhouses and barn were officially opened by BC Premier Christy Clark in 2014. An internal steering committee was struck to develop a mandate for the new ACE. Fehr’s appointment as ACE director is the latest stage in the process of developing the centre. Diploma and certificate programs offered by the Agriculture department at UFV will continue to report to Dean of Applied and Technical Studies, John English. UFV also offers a Bachelor of Business Administration in Agriculture Management, and there is a Bachelor of Science in Agriculture in development. 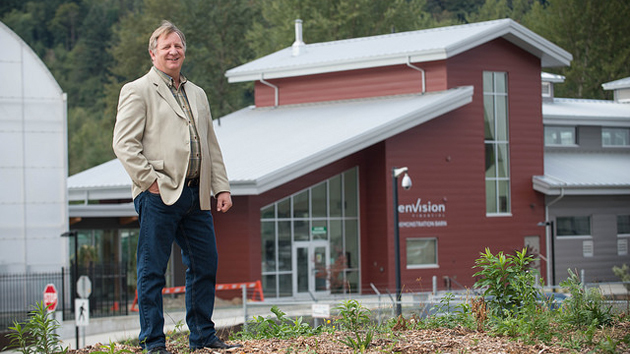 Be the first to comment on "Garry Fehr – New Director Of Agriculture Centre Of Excellence At UFV"